Full disclosure: I’m a FishingBooker employee and this fishing trip was organized as an annual corporate retreat. The review itself has not been sponsored in any way and represents an honest opinion on Soolyman charters’ operation. A blast - the first word that comes to my mind when describing our 2 full day charters with Captain Dylan! 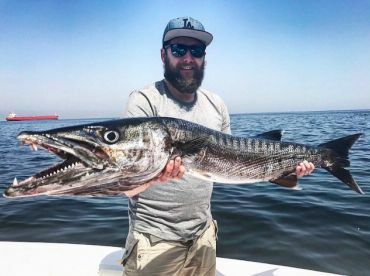 I’ve been on fishing charters a dozen times in the US and Europe, and this was the best fishing experience I’ve had so far! Both days on the water were great, but I’ll describe just the second day to keep it short and sweet. 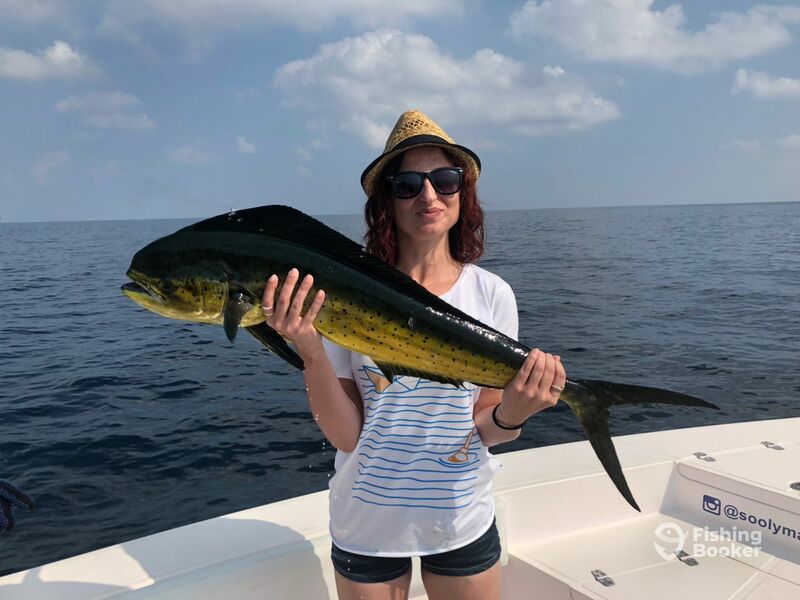 I’d first mention that Yellowfin 3 is an awesome boat for fishing, a spacious center console 38-footer with a lot of space to move around - this was important as the Mahi turned out to be pretty stubborn so the person holding a rod had to change positions all the time. 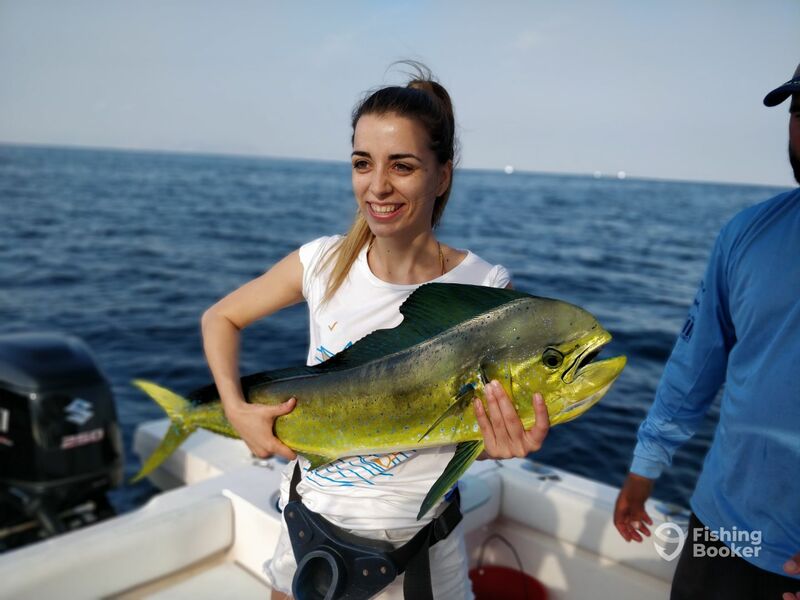 The boat is also super fast, equipped with twin 250 horsepower Suzuki engines, which makes it easy to reach the fishing grounds in no time. This meant more time for fishing. Although very young, Captain Dylan is very knowledgeable and a great professional. He’s fished his whole life and just looking at him doing stuff like casting a rod 80 meters away with ease makes you think everybody could do that. And not just that - Dylan is also a great and easygoing guy. 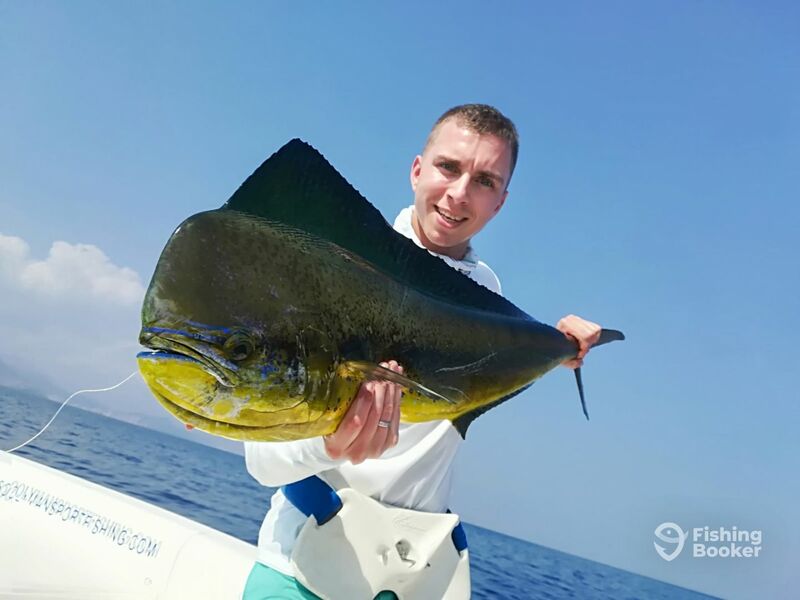 In other words, the captain you’re hoping to get on your fishing charter. After catching live bait fish, we got to the first buoy and were put on fish in no time. Dylan used a popper to see if the fish were around and then cast a rod close to the place where the fish appeared. 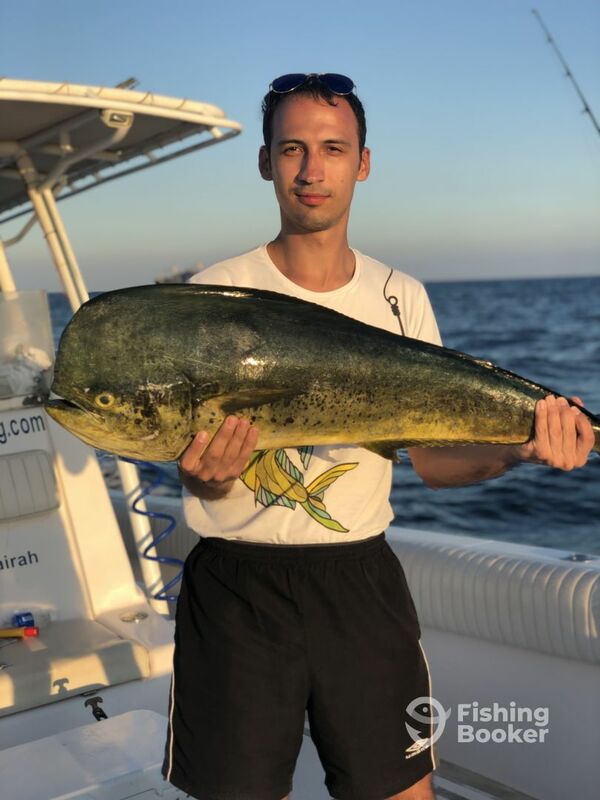 After the first bite, the other Mahi came closer to the boat. In just a couple of minutes, 5 of us were holding a rod with a fish hooked on! 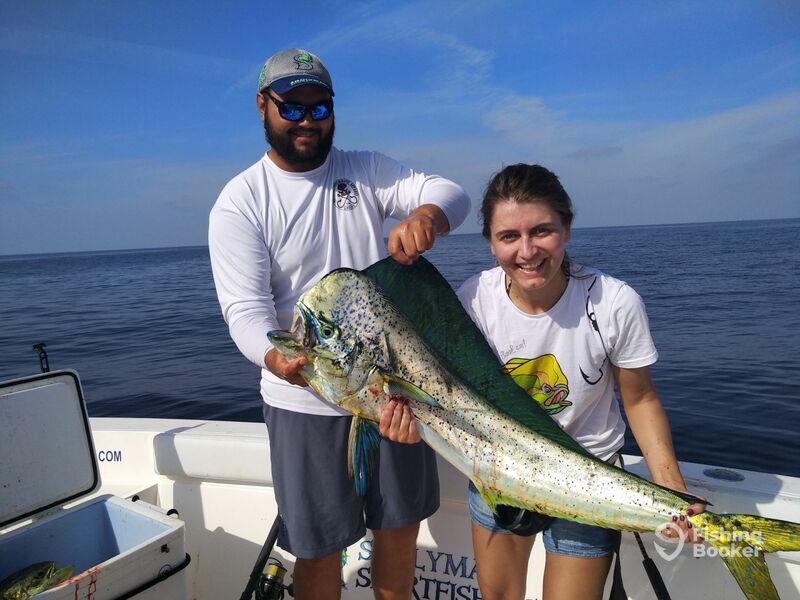 We were running around trying not to hit each other, and, eventually, we all managed to catch our first Mahi! By the end of the second hour, we managed to reel in 12 of them! Since we had enough fish from day one, we decided to aim for catch and release. 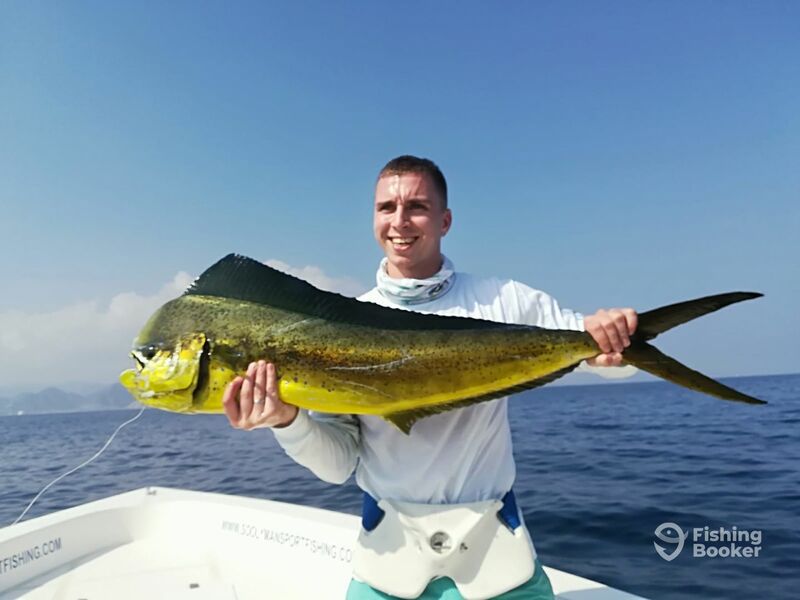 In the end, we released 11 out of 12 and kept only one, a 22-pound Bull Mahi that was injured. 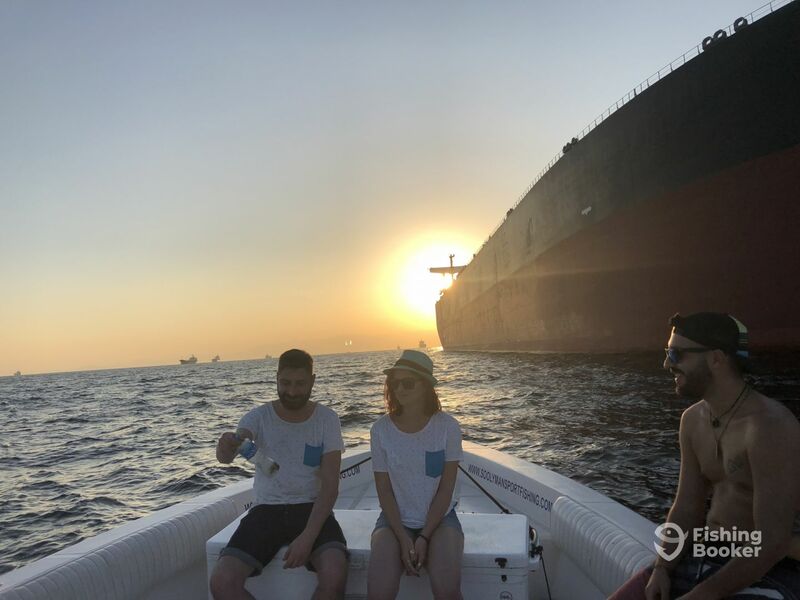 When we exploited the buoys we switched to trolling near many oil tankers nearby. Trolling can be boring if nothing’s going on, but this time it wasn’t. The Mahi frenzy did slow down, but it was interesting to watch Dylan’s decision-making process while trying to improve our chance to catch more. I liked that Dylan was active and doing his best during the whole trip. When there was no bite, we chatted about fish species, fishing, boats, and much more. By the end of the trip, we managed to land 6 more Mahi and ended our day at 18. More than satisfying. Thank you so much for your detailed review! 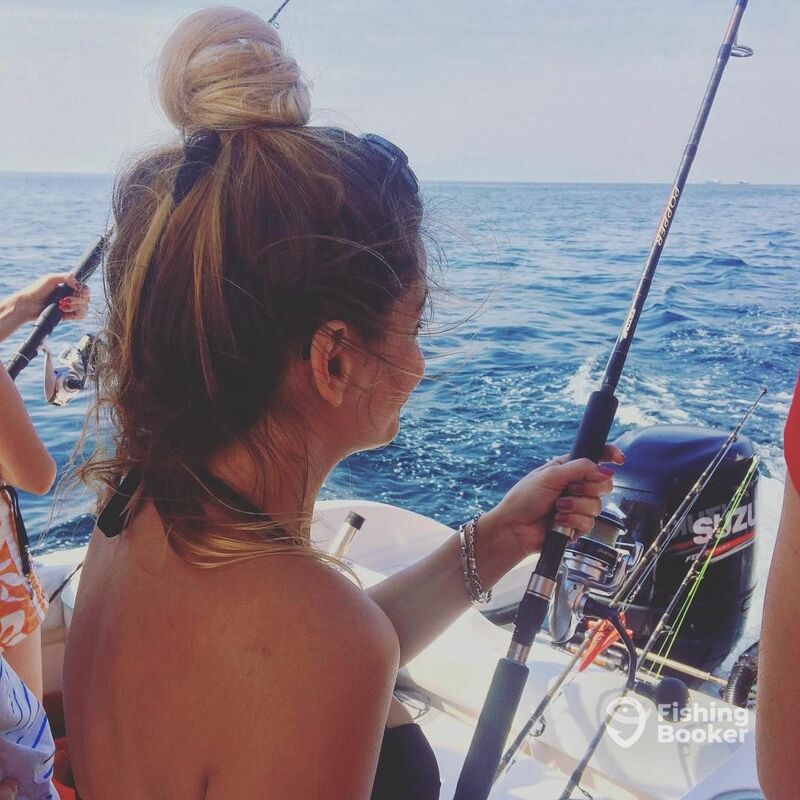 Glad you enjoyed it and we look forward to fishing with you again soon! Thank you so much for your detailed review! 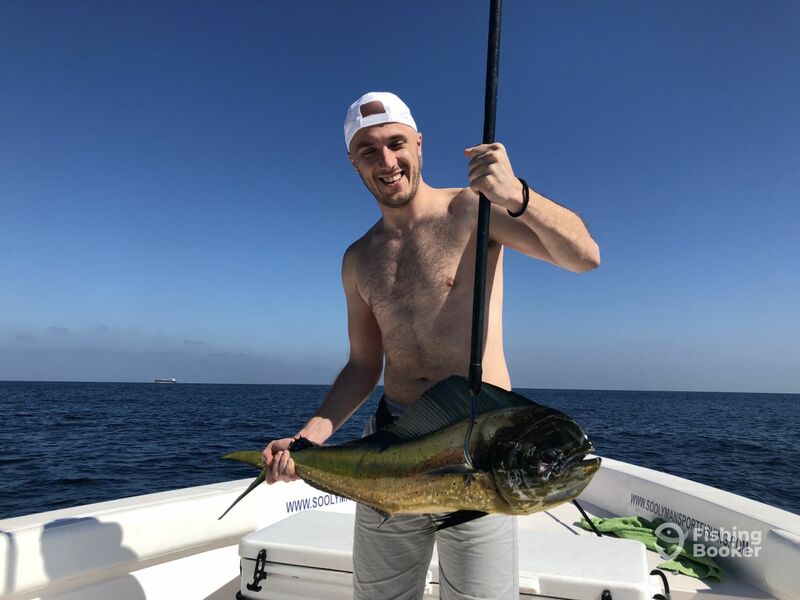 Glad you enjoyed it and we look forward to fishing with you again soon! 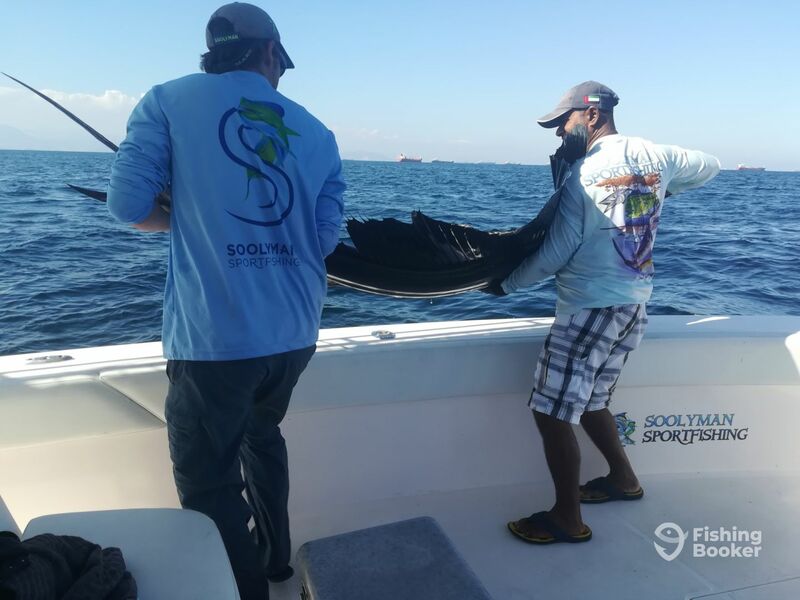 Team Soolyman Sportfishing ? Full disclosure: I’m a FishingBooker employee and we organized this fishing trip as an annual corporate retreat. 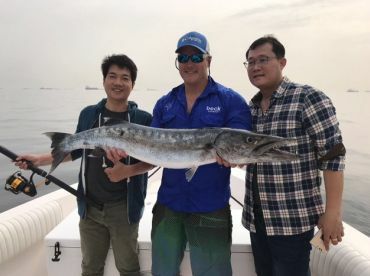 We had a fantastic time fishing with both Capt. Ricky and Brad aboard Soolyman Charters - 38’ Yellowfin 2. 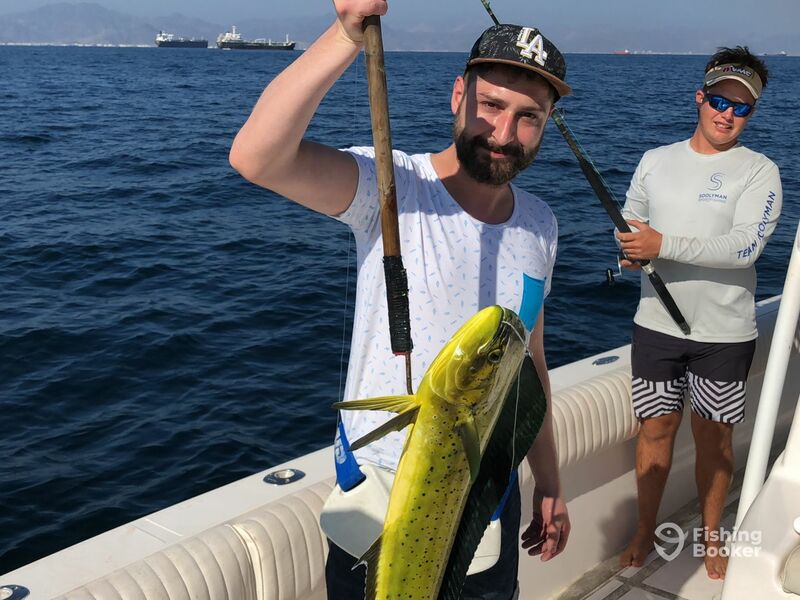 The first trip started at 9:15 am due to our late arrival to Fujairah the night before, so we planned to fish a bit later than usual (usually, trips start at 6 or 7 am - highly recommend). Knowledgeable guys, they know their stuff - they know how and where to find fish. The rest was on us. 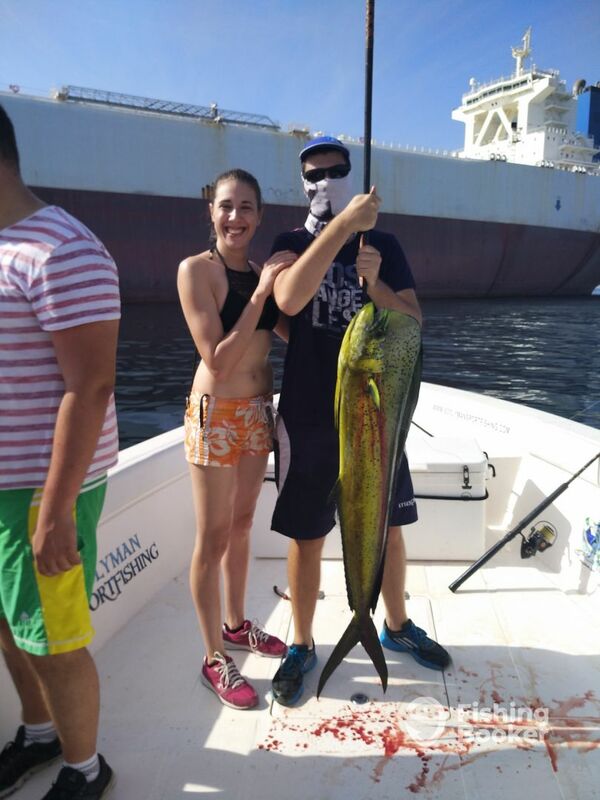 :) We (6 of us) ended up catching 5 Mahi Mahi (Dorado) and 3 Bonito (Skipjack Tuna). We trolled throughout the trip, and I can’t say it was the most fun technique in comparison to day 2 when we did drifting with live bait (bullseye). Overall, a good trip, but a bit less active when it comes to us as trolling doesn’t keep you busy unless you’re fighting a fish (no casting, popping and other fun stuff). On Day 1 we fished and kept most of our fish to cook it in a local restaurant (we caught enough fish for the next day so that we can do ‘catch & release’). Mahi Mahi was tasty, and everyone enjoyed the dinner. Day 2 started at 7:00 am and was much more productive! What an amazing day! Our group counted 34 people in total, and they fished aboard five other boats. 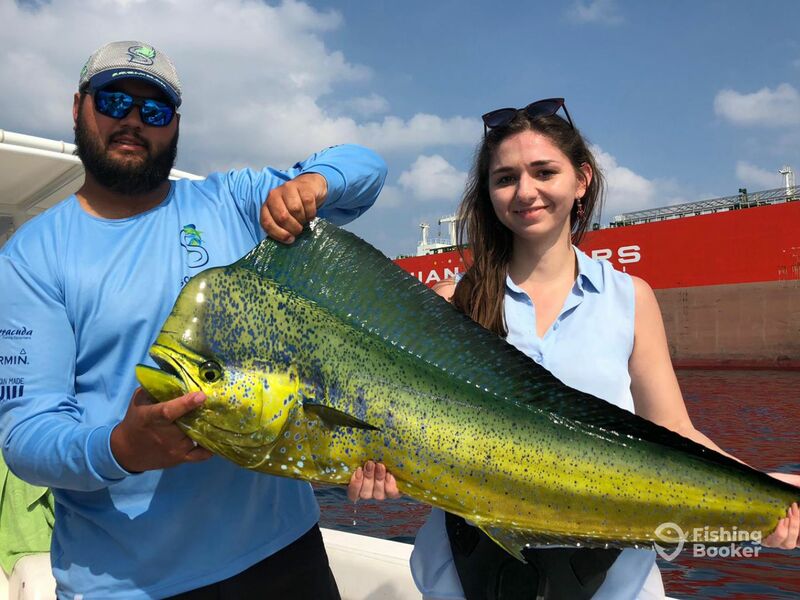 We broke the record and caught 25+ Mahi Mahi on our boat ALONE!!! Wow, what a day. Not that we just caught more fish, but we stayed busy casting and popping. We even fought five fish at the same time. Fighting the fish was fun, catching and releasing was terrific! The biggest fish we caught was over 20 lbs, and we fought it for about 15 minutes. It was exhausting but worth it. 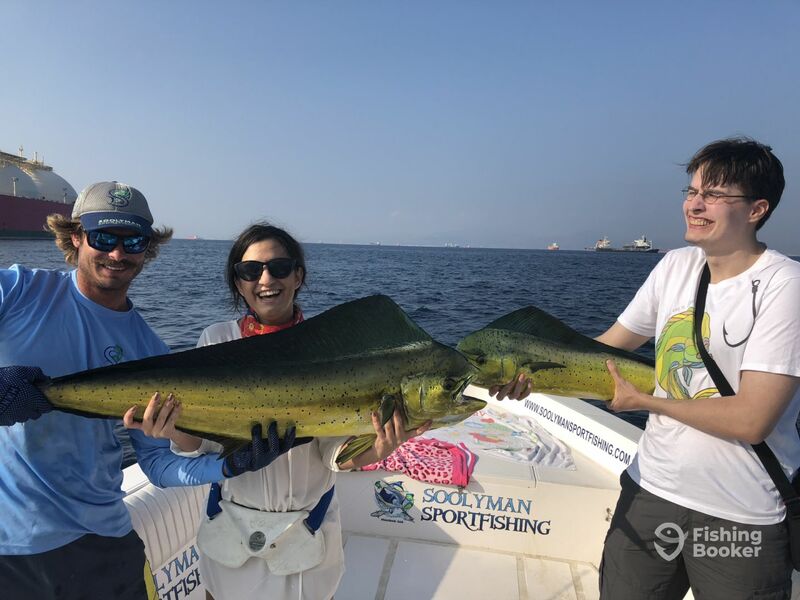 We highly recommend Soolyman charters to everyone - excellent customer service, professional fishermen, and fishing sustainably which we find extremely important (taking care of the environment). We appreciate your detailed review on your 2 trips with us last month and are glad that you enjoyed it and will recommend us to others! 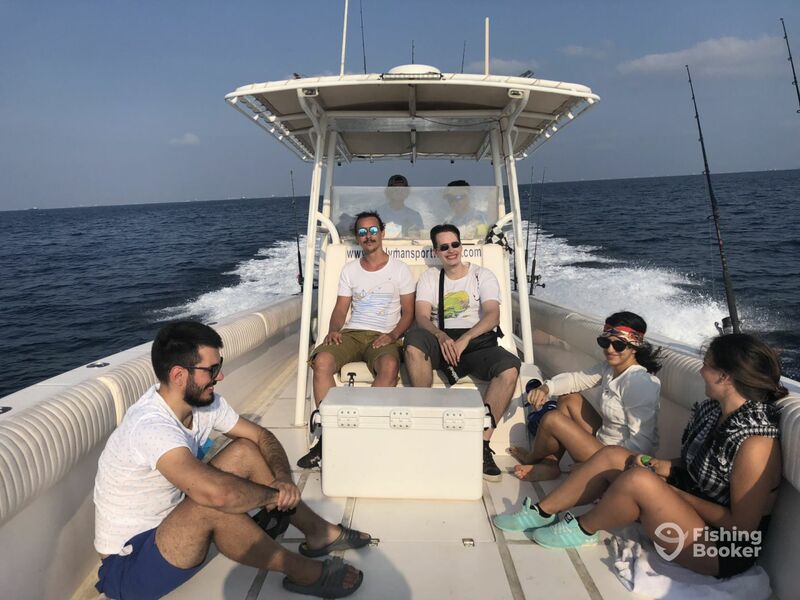 We look forward to fishing with you and your team again soon! Full disclosure: I’m a FishingBooker employee and this fishing trip was organized as an annual corporate retreat. 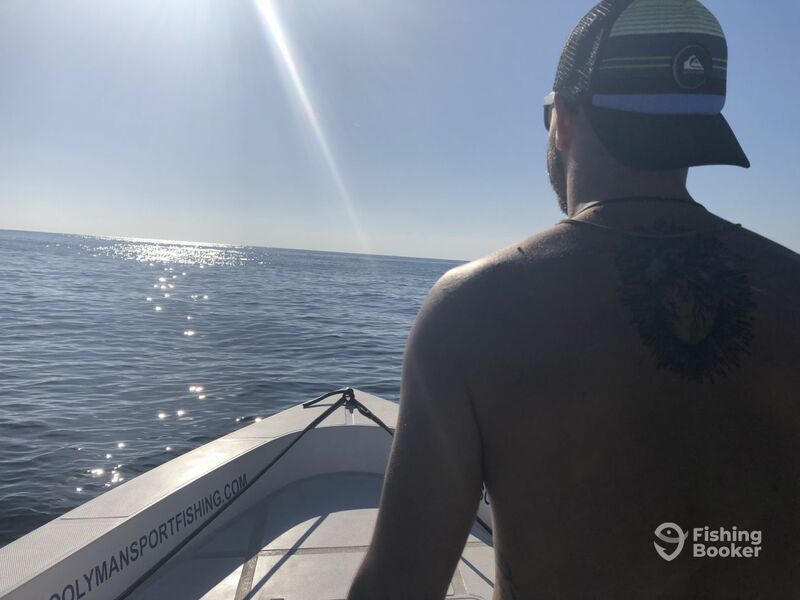 The review itself is not sponsored in any way and represents an honest opinion of the trips, Soolyman charters and the crew. 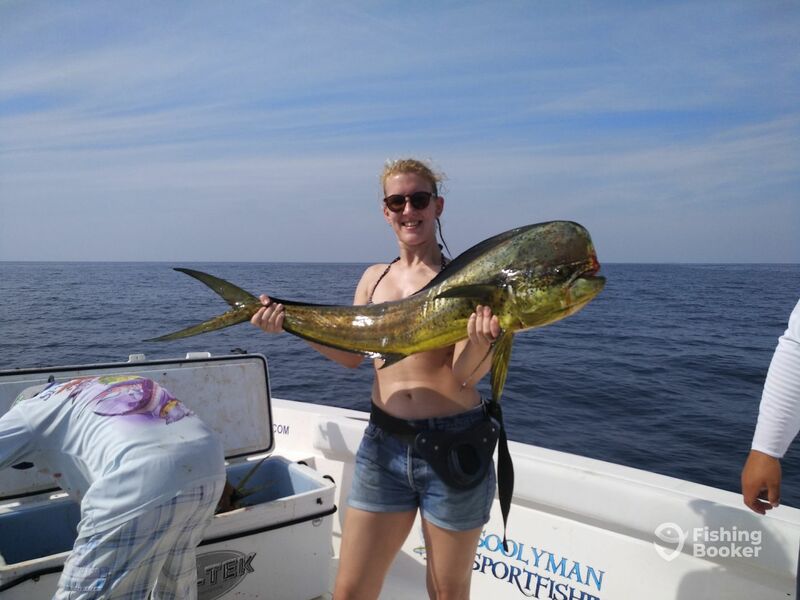 We have spent two full days fishing with the captain Dylan on Soolyman Charters - 38’ Yellowfin 2. There were 6 of us on the boat along with the captain and mate and there was plenty of room for everybody to fish at the same time and move around. The boat was really clean and spacious despite having two huge coolers - one with the refreshments and the other one for keeping the catch. The captain and mate were there for us at all times! Since we arrived to Fujairah the night before, we had to start the first day bit later (after 10am) and that might have been the reason we weren’t as successful as we were the second day. 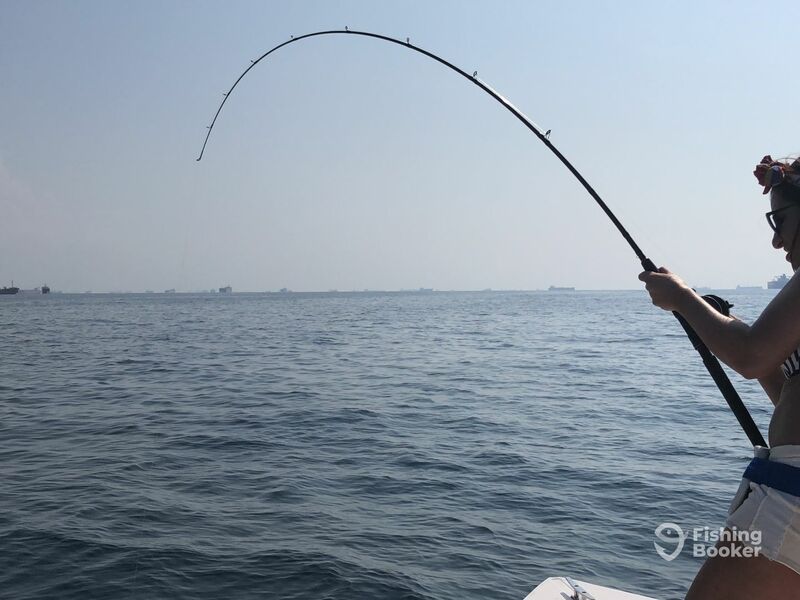 The first day was too hot and slow (we mainly did trolling) and we caught only two fish, but the other boats were bit more fortunate, thus we weren’t left without the dinner! All in all, we had an amazing bonding time and action-packed team building! 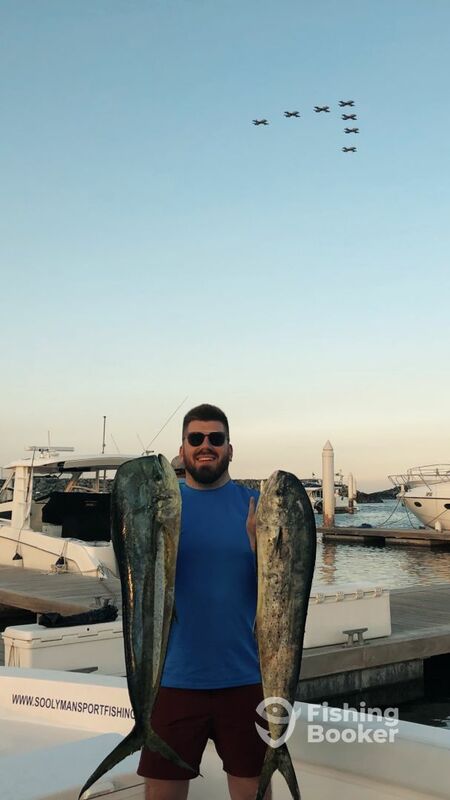 I highly recommend creating memories and bragging fishing material with Soolyman Charters and captain Dylan! Thank you so much for your detailed review! We are glad thay you enjoyed your two trips with us and we will be sure to pass your comments on to Captain Dylan. We look forward to fishing with you again soon! Hi Tanja, Thank you so much for your detailed review! We are glad thay you enjoyed your two trips with us and we will be sure to pass your comments on to Captain Dylan. We look forward to fishing with you again soon! 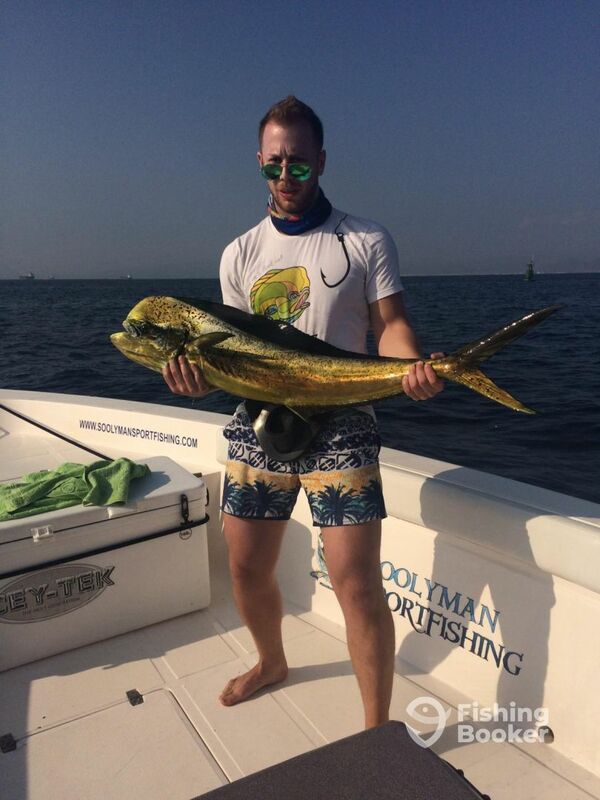 Team Soolyman Sportfishing ? Full disclosure: I’m a FishingBooker employee and this fishing trip was organized as an annual corporate retreat. 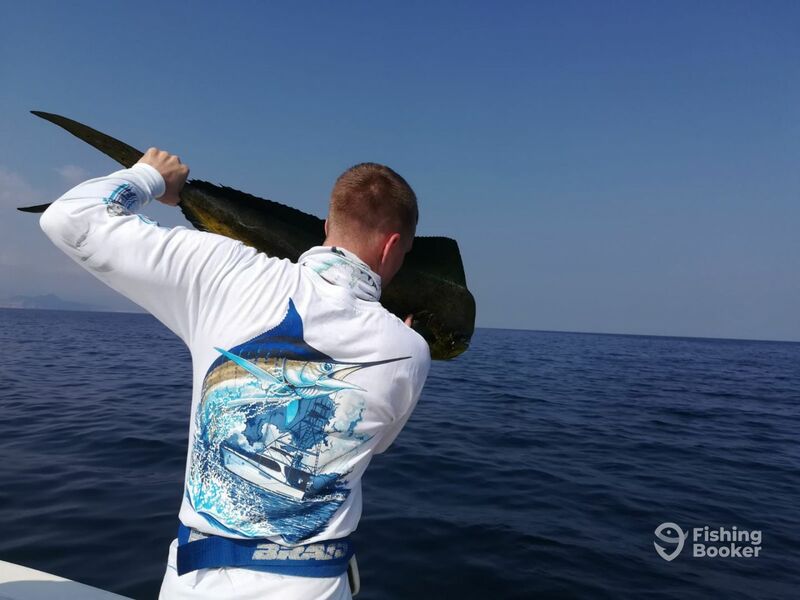 This was the first offshore trip for most of us, and most definitely an unforgettable one! The day started off uneventfully at 9 AM, with the first hours of trolling yielding nothing. 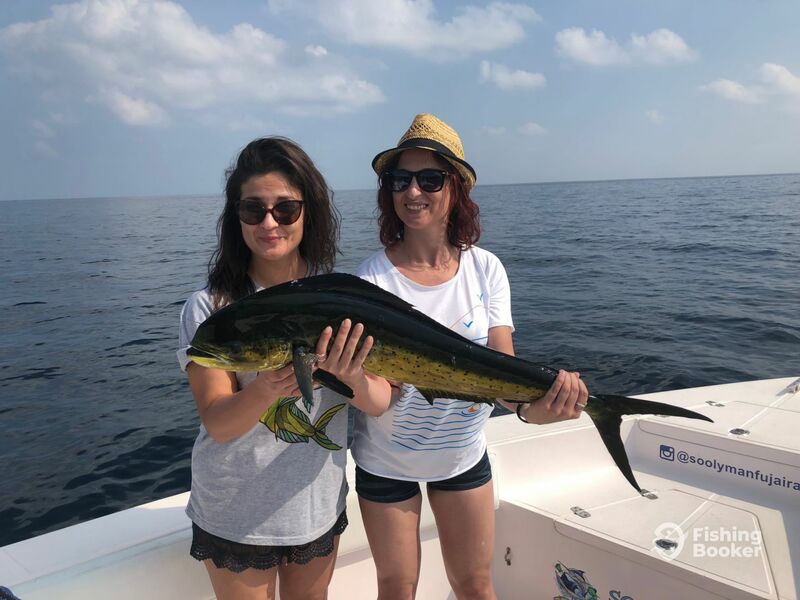 Around noon, the fish started biting and we quickly boated a few nice sized Mahi Mahi and Bonito. Captain Luke and mate Chin were very friendly (despite Chin having a fever during the trip), and taught us some fun facts about the area and fishing in general. They were also very patient with the beginners, and the captain was happy to reply to all of our questions. The captain and the mate respected our wish to catch and release, making sure that every fish was released as gently as possible. 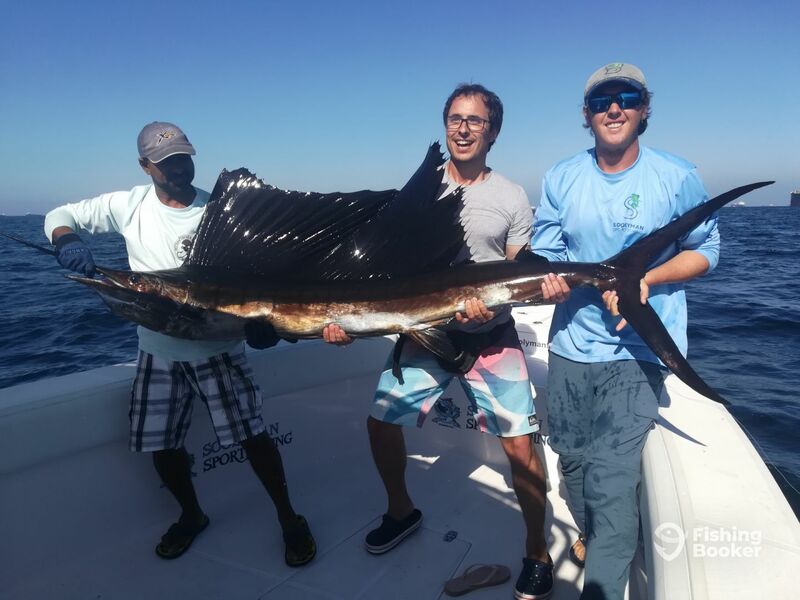 The fishing highlight of the day was a 7’ Sailfish, which we successfully landed after a 20-minute fight. 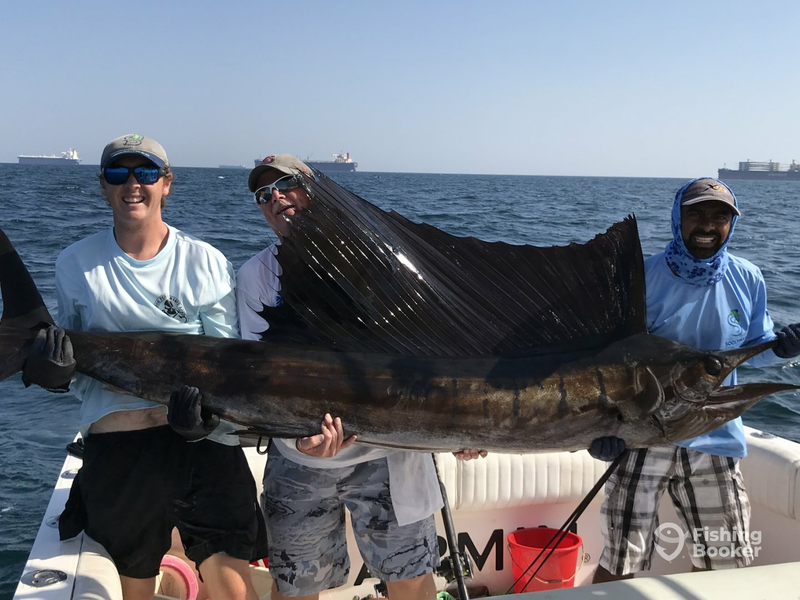 The Sailfish made a couple of huge jumps during the fight, which was an incredible experience for everyone on the boat. 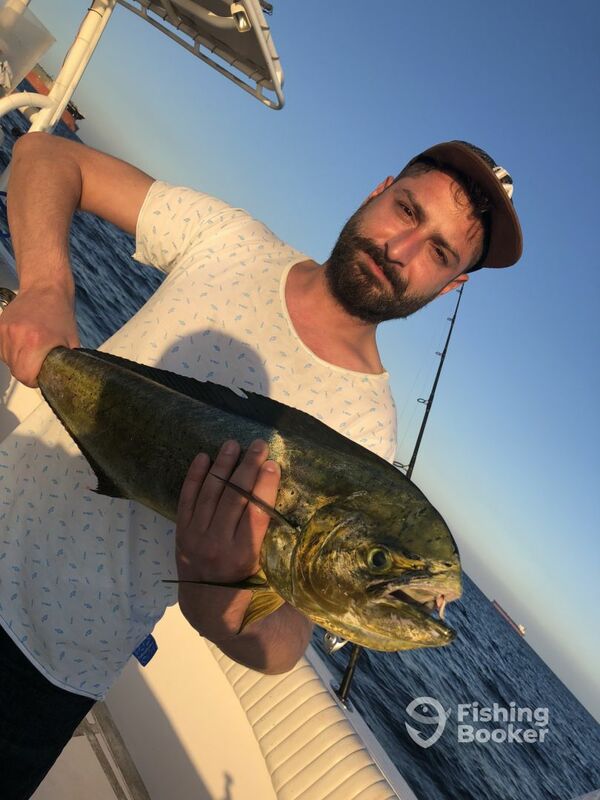 The fish was hooked nicely in the corner of its mouth and the crew made sure it was released and swam away unharmed after taking a few amazing photos. They were very professional and efficient during this process – it took them less than 15 seconds or so to get the fish out of the water, bring it to the front part of the boat, and release it back. Trolling leaves plenty of time to chill and relax on the water while moving from one spot to another, and we enjoyed these moments as much as the action. We were blessed by great weather and overall it was an amazing day of sun, fun, and fishing action. 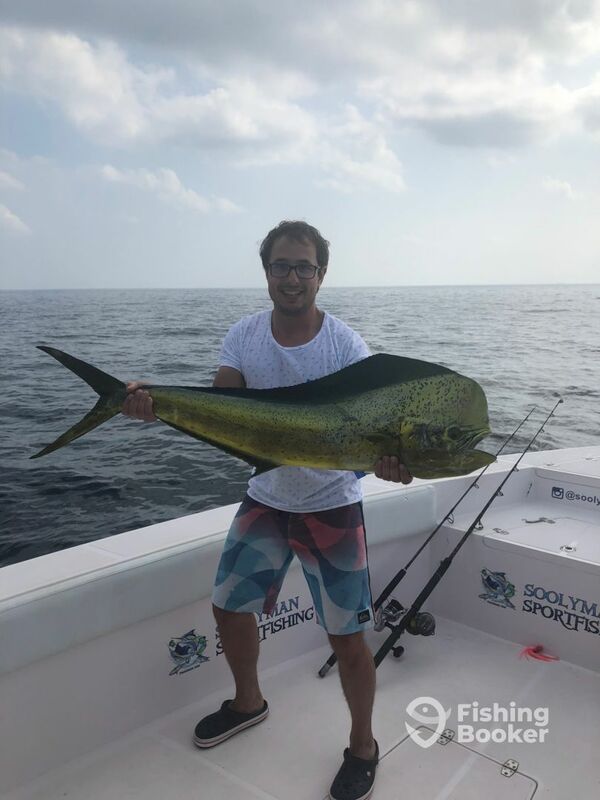 Our second day of fishing aboard Soolyman – 32’ Yellowfin 1 started at 7 AM. Initially, we were worried about the weather, but the wind quickly subsided and conditions for fishing were good. 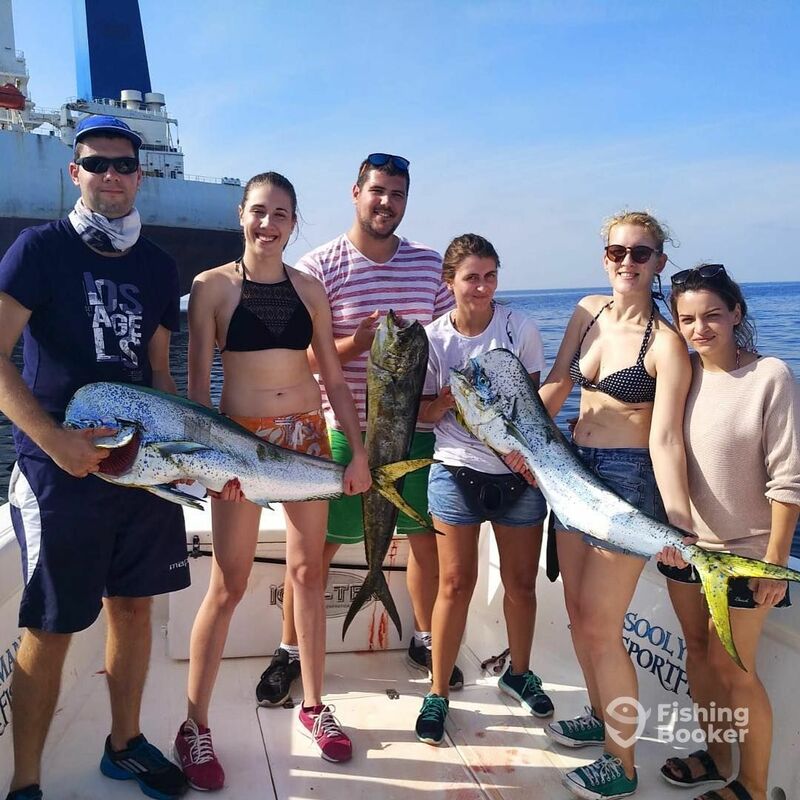 We tried various fishing techniques, including trolling, live baiting Bonito for Sailfish, as well as casting lures for Mahi, Barracuda, and Bonito (the captain called them ‘Bunnies’) around the tankers. 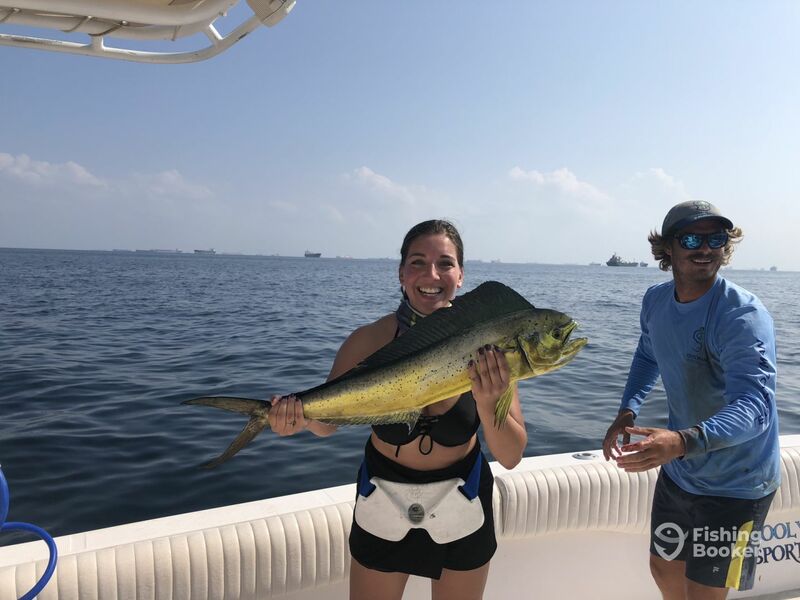 Everybody on the boat caught fish, with at least 6 nice-sized Mahi released by the end of the day, along with a couple of Bonito. 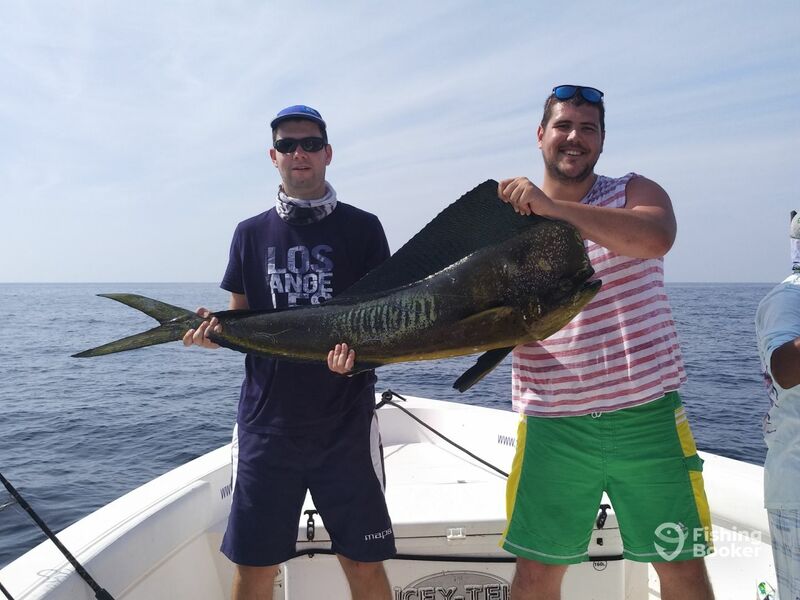 We also had two Sailfish takes over the course of the day, one on live Bonito and one on trolling. The live Bonito take was magnificent to watch as the Sailfish was barely 3 meters from the boat and we saw it on the sonar prior to the take. 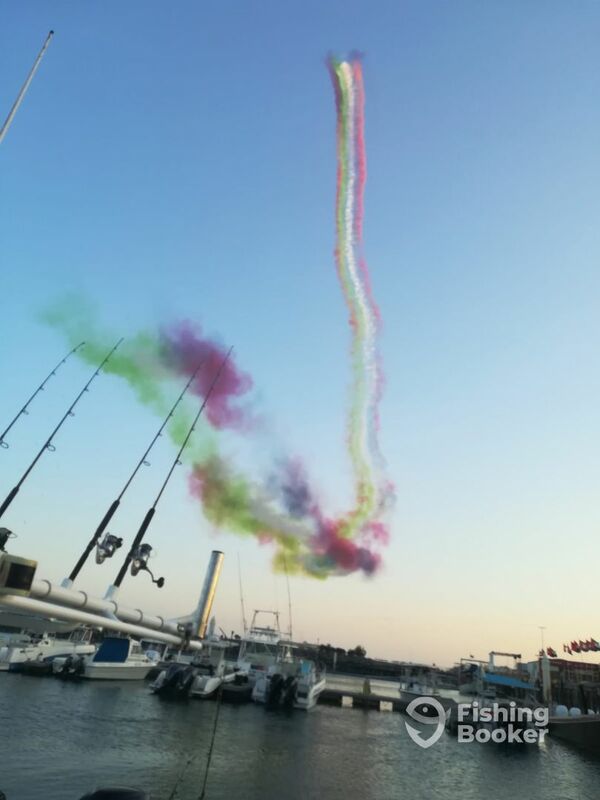 A fight ensued with spectacular jumps, but we didn’t set the hook well and it got away. 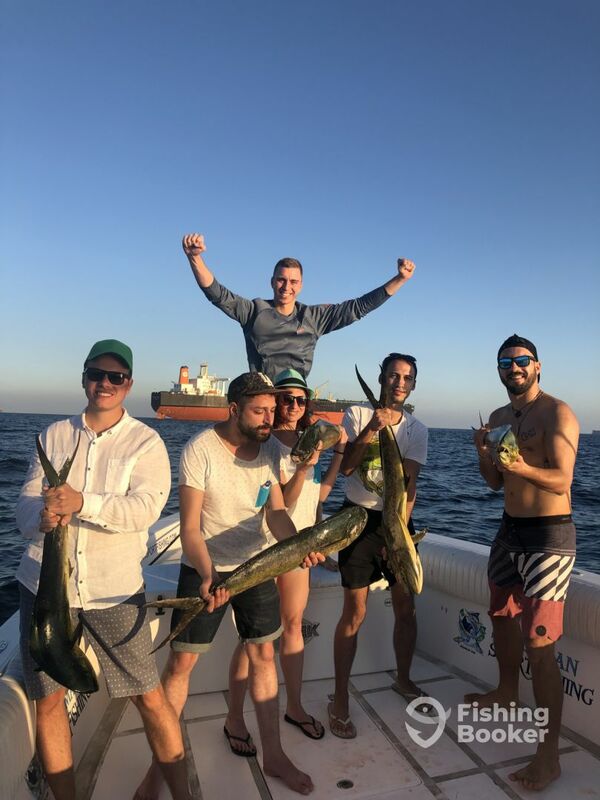 However, this experience proved that fishing is so much more than just catching – we enjoyed every second of this fight! 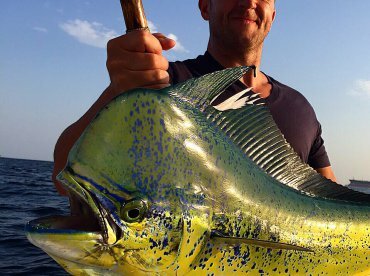 With no first mate was onboard, the more experienced anglers among us got to learn how to land Bull Mahi safely for catch and release. They also learned how to tie a few fishing knots for trolling. 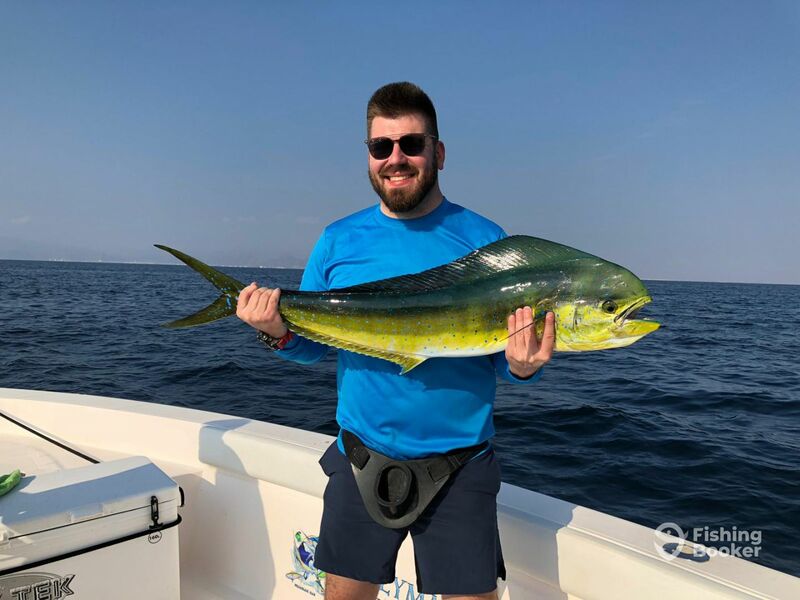 First-time anglers had a blast on this trip, too – captain Luke’s passion and excitement were contagious, and he made us fall in love with fishing! 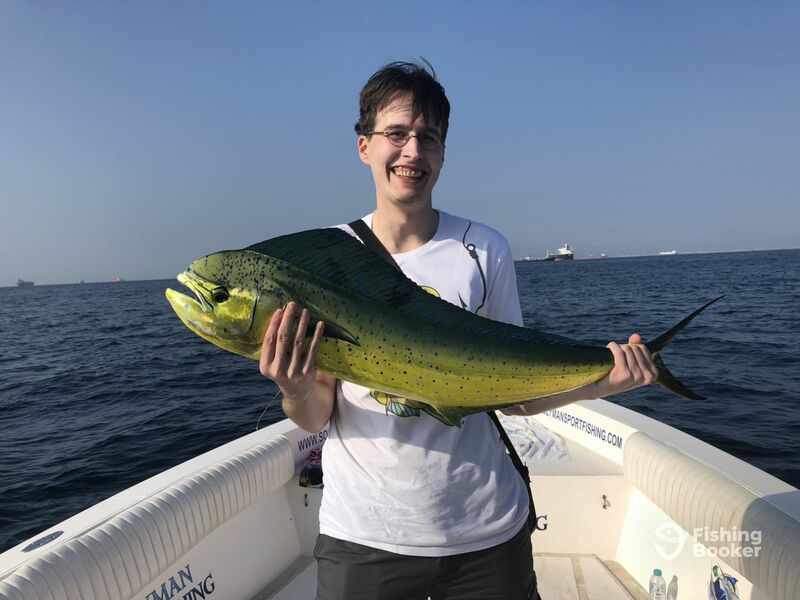 We also appreciated his love of nature and marine life – he was more than happy to teach us everything he knew about local species, as well as fish and fishing in general, especially Tuna fishing. We even got to see turtles and sea snakes, and learn more about them as well. Captain Luke did everything possible to make us feel comfortable, teach us new things, and keep us involved. Fishing with him was a wonderful experience – both thrilling and educational, both action-packed and relaxing. 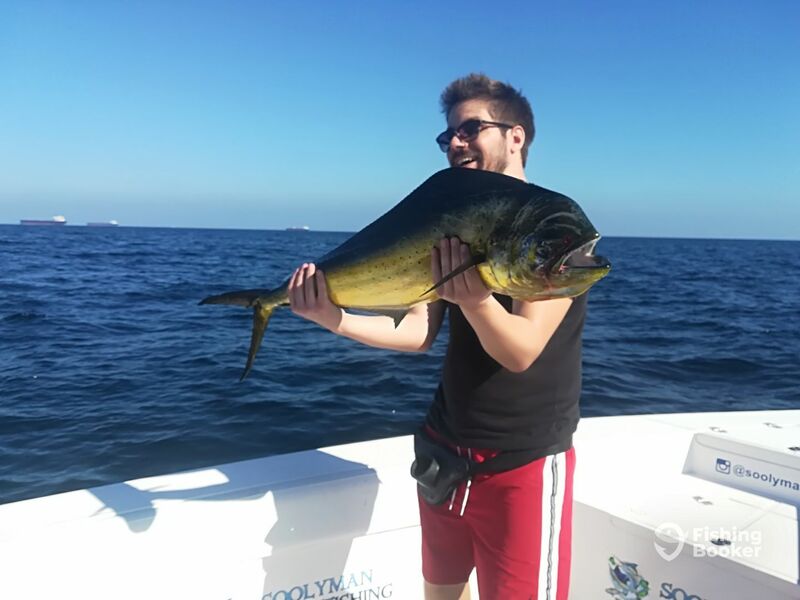 We would definitely recommend Soolyman – 32’ Yellowfin 1 to both novice and experienced anglers! Thank you so much for your detailed review! Glad you enjoyed it and we will be sure to pass your comments on to Captain Luke & Chin. Thank you so much for your detailed review! Glad you enjoyed it and we will be sure to pass your comments on to Captain Luke & Chin. We look forward to fishing with you again soon! 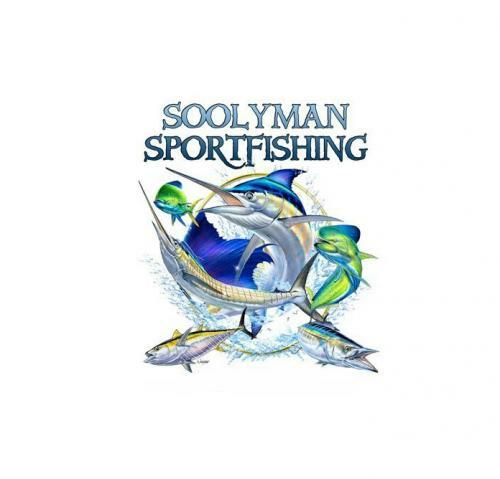 Team Soolyman Sportfishing ? Fishing conditions weren’t the best but Capt. Luke did his best to put us on some fish today. Managed this beauty and guessing it was 130-150lbs.